This bizarre creature is called Gasteruption Jaculator. I kid you not! 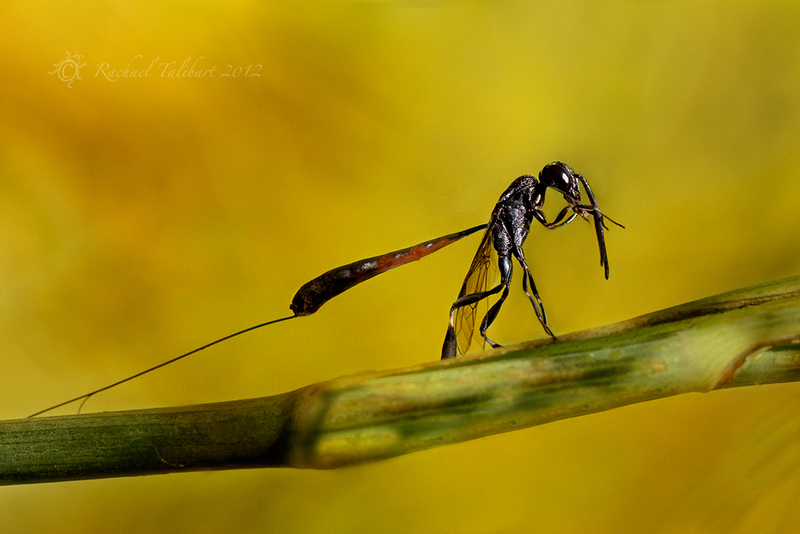 I posted some shots of this strange wasp last month, wrongly identifying it at the time as a type of sand digger wasp. I am grateful to afrenchgarden for the correct i.d. They do look strange in flight. Well, I admit it, they look strange all the time! Strange, but harmless, to us. Not so, however, for solitary bees, on whom these wasps are parasitic. 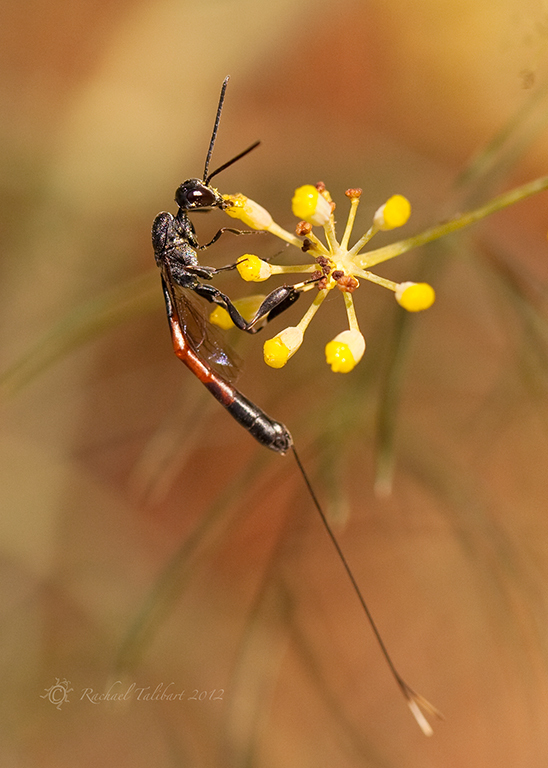 That long spike is an ovipositor, with which the female deposits eggs on the larvae of solitary bees. You can guess the rest. For my earlier post on these weird critters, see here. 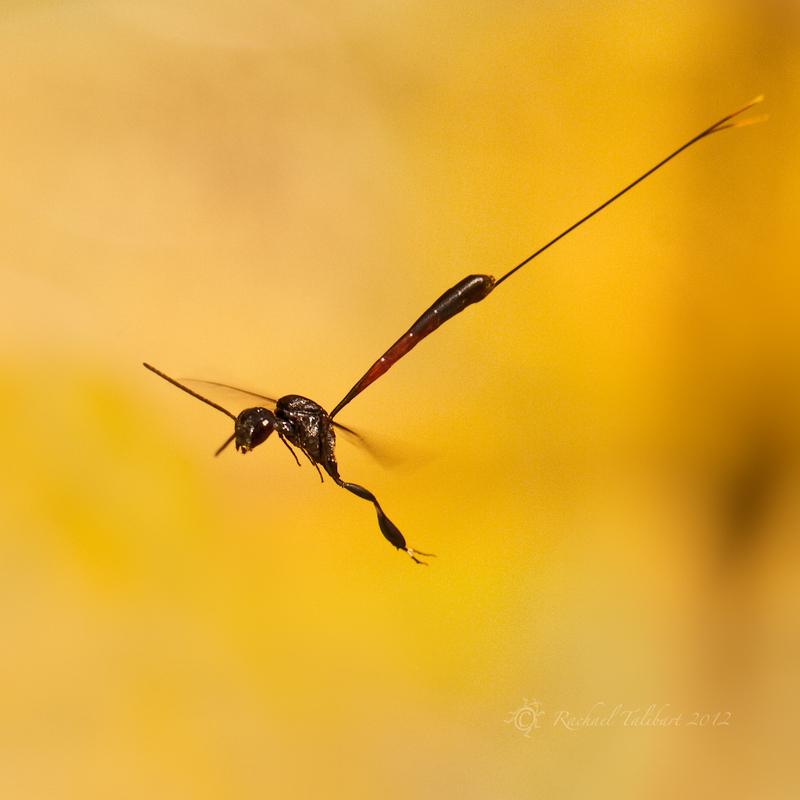 This entry was posted in garden, nature, photography and tagged gasteruption jaculator, insect, macro, natural history, nature, parasitic wasp, photographs, photography, wasp by Rachael. Bookmark the permalink. I’ve never seen anything like it, thanks for sharing these great pics! They really are weird. That is a great in-flight photo. Thanks. The top one creeps me out a little. Standing up! Creepy but a fantastic capture. Beautiful! I saw some of these flying around in Portugal and thought they looked a bit evil. Turns out… they are, but thankfully we’re safe! Thanks, Jaina. They are freaky! But I like them. I like solitary bees too. Argh! Does not compute! Programming error! Haha! What would you do, that’s the question, if faced with one of these guys going all homicidal on a bee? Whoa, I’ve never seen anything like that before. The top one looks like the creature from the movie Alien. haha. Gorgeous shots though, as always. Thanks :). ReAlien, that’s exactly what I thought! That’s fascinating, and the photos are exceptional. Nice work! Thanks, Paul. She is indeed fascinating. What a strange looking creature – the top photo really looks like something out of a sci fi film! Great photos though. Thanks. Yes, the top shot reminds me of the Alien movies. All three shots creep me out. Amazing capture, though. Oh Wow… Gasteruption Jaculator… It sounds like this guy lives up to his name:-). I find her (?) more fascinating than creepy, and am inspired to learn more – like how enormous they are. Fabulous shots! Hi Sid. Yes, a she. She is not very large, certainly not enormous, which given her appearance is something of a relief! You can see her here on fennel. My recent honey bee shots are also on fennel, so you can compare sizes. I’ve been after a band name for my next rock’n’roll combo and I think your post has delivered! That beast is going to give me nightmares. Perfect band title! Yes, it’s a little creepy. A friend of mine has written a poem about it inspired by these shots. I will add it to the post.